Some of the people getting food stamps do not have their photo on file already at the Registry of Motor Vehicles, so they have to come in to have their pictures taken. Then, during picture-taking time, there was a sewage backup at the Framingham welfare office, forcing that building to close. 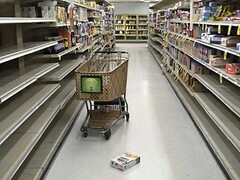 And then the state’s EBT card vendor, the Xerox Corporation, mistakenly “deactivated” hundreds of cards last week, leaving those card holders (on the weekend before a snowstorm) with carts full of groceries but no way to get them out of the store. We are pleased and relieved to tell you that USDA Headquarters officially communicated with EOHHS this AM urging DTA to "temporarily halt further implementation of the photo EBT requirement". USDA HQ has requested that the state to "temporarily halt further implementation of the photo EBT requirement - including the scheduling of appointments and deactivating non photo EBT cards." NOTE: as of this email, we do not know if DTA will honor this request. Until further notice, we cannot guarantee that the EBT photo process is suspended. Interesting in helping avert another disaster this January. Help us stop bad welfare reform in Conference Committee. We need Letters to the Editor in local papers. Sample language can be found here.